This is a rich face and body butter that forms a protective barrier over skin without feeling heavy or thick. It soaks in quickly and leaves you in control of your moisture level. Organic Sea Buckthorn Oil helps to brighten tone + texture as well as fade the appearance of old scars as well as reduce hyperpigmentation and age spots. Everything I make is made to be used in many ways. Because this is so pure, you can use it head to toe! Anywhere you need moisture + softening, you can use this! This cream does double duty, great for both your face and body. Soaks in quickly + never greasy. Brightens skin + evens tone + reduces scars. If you have any kind of scarring, acne scarring, or uneven texture this is the one product that will address all those issues. Great for even the most sensitive skin. Silky Butter soaks in quickly + leaves skin soft all day. Sea Buckthorn Berry Oil : Comes from high in the Himalayan Mountains. It grows in one of the most harsh environments in the world, and all the qualities it requires to survive, it offers as benefits to our skin. Rich in vitamins B1, B2, K, C, A, E + Folic Acid + at least 20 minerals + 60 antioxidants + Omega Fatty Acids 3 - 6 - 9 + the very rare 7. Sea Buckthorn helps to build proteins + brighten + even tone + reduce signs of aging + so much more! Maracuja Oil, from Passionfruit Seeds : Rich in naturally occurring Vitamin C Esters, and helps to brighten and even skin tone. It is amazingly light and nourishes even the driest skin. 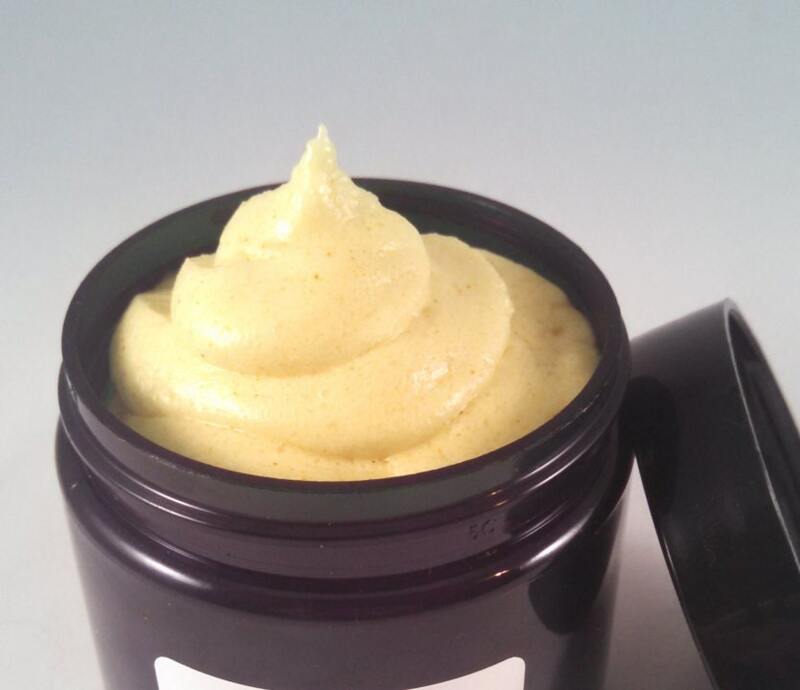 Shea Butter: Rich in Vitamin A which helps to reduce signs of aging + age spots + scars. Leaves a protective layer on the skin, protects from environmental stressors, but soaks in quickly. Deeply moisturizes all skin types, especially dry + cracked + dehydrated skin. Organic Hemp Seed Oil : Rich in omega fatty acids that provide skin with building blocks for healthy cells. It also happens to be anti-inflammatory, helping with everything from Keratosis Polaris to Eczema and dry skin. Considered a "dry" oil, it quickly absorbs into the deepest layers of skin. Rich in Linoleic Acid, it helps keep sebum from becoming thick and actually helps unclog pores. Apply to cleansed skin as desired. Try using right out of the shower on damp skin. Great before applying mineral makeup.